Wholesale Mattress Center is a family owned and operated, local mattress and furniture store that is proud to call the Auburn and Opelika communities home for more than twenty years. We believe that our corner of the world is a special place, and so we strive to provide better sleep experiences and comfortable living spaces, from Lake Martin to Columbus. We’re your neighbors, so we will give you the kind of personalized service and individual attention that you won’t find anywhere else. At Wholesale Mattress Center you can find the largest selection of mattresses in the area, and an extensive collection of furniture to rival any of the national retailers. Our offerings include mattresses and accessories by Tempur-Pedic, Sealy, Simmons, Beautyrest, Stearns & Foster, and many more. Located on Opelika Road, our showroom is convenient to both Auburn and Opelika, and our delivery service extends throughout Lee County and beyond. Our expert knowledge of sleep technology and our second-to-none customer service are the qualities that truly set us apart. Our friendly staff can help you find the perfect choice for your sleep comfort, at any price range. Restful sleep is part of comfortable living, and we believe that a friendly, inviting living space that reflects your style is also essential. We offer furniture collections that range from classic to contemporary, decorative to formal, on-trend to timeless, and are suitable for every room in your home. 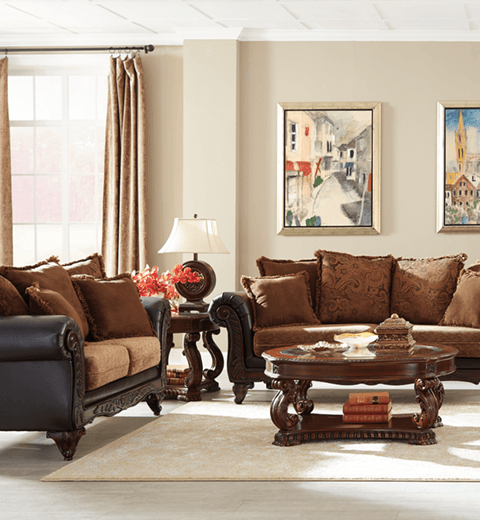 Our furniture selections, crafted by Coaster and Leggett & Platt, are designed to provide comfort, durability, and elegance for years to come. Come by our showroom, and we will explore with you the ways that your home can feel even more like your own.